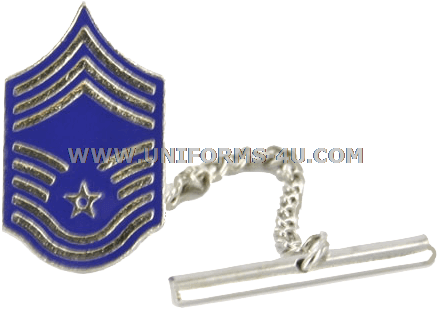 A trio of upward-oriented chevrons and five down-ward-facing “stripes” has been the rank insignia for Air Force Chief Master Sergeant since 1991. The insignia is featured on this tie tack / tie clasp authorized for wear by Chief Master Sergeants on the necktie worn with a variety of Service and Service Dress uniforms; the tack / clasp is attached to the center of the necktie, equidistant from the base of the knot and the bottom tip of the tie. The highest enlisted rank and grade (E-9) in the Air Force, Chief Master Sergeants (CMSgts) may be assigned to one of a variety of leadership positions, including First Sergeant, Command Chief Master Sergeant, Group Superintendent, Functional / Career Field Managers, Professional Military Educations Commandants, or Command Senior Enlisted Leader. Because of the experience they have acquired in working their way up the NCO ladder, they are tasked with developing and guiding not only junior Enlisted personnel and Noncommissioned Officers, but also Company-Grade Officers.